IMC Executive Director Noel Ramos. MYSTIC – Singer-song­writer Kay Pere of Mystic was one of five recipients of a 2007 Immie Award at the national Independent Music Conference in Philadelphia, Penn. held Aug. 30 to Sept. 3. In presenting the award, Conference Director Noel Ramos cited Pere's long history as a social activist through music, raising money and awareness for many charitable causes from Connecticut to California. Also noted was her success as an independent perform­ing artist and songwriter having recorded in Nashville with Grammy-Award winner Michael Hopkins, and her longtime service to inde­pendent artists as a mentor in the areas of vocal coaching and creativity. Pere is a director of the Connecticut Songwriters Association, and is the asso­ciate director of Local United Network to Combat Hunger. Also on hand and receiving awards were John Lilley, guitarist from the internationally known group The Hooters, Brooklyn-based hip-hop artist Coole High, music publisher Robert Case from Denver, Colo. and the Japanese­turned- Nashville band The Tokyo Tramps. Since 2003 the Independent Music Conference has been held in Philadelphia, attracting artist and industry profes­sionals from across the U.S. and abroad. 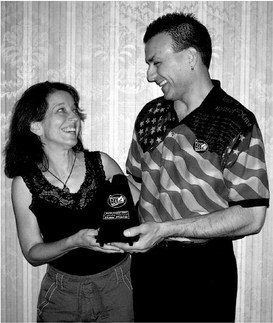 Bill Pere, (husband of Kay Pere), received an Immie Award in 2003 as the national Independent Artist of the Year.